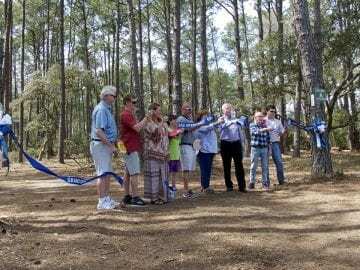 “This is a tremendous gift to this community,” Kill Devil Hills Mayor Sheila Davies told the large gathering that came for the ribbon-cutting. Located at the end of a gravel road that parallels the First Flight High School athletic complex, the course is on 35 acres of the Baum Tract. The course is named in memory of Casey Logan, who died at age 24, and is a tribute to his spirit from his parents Bob and Lin Logan. It was, however, a long journey. The idea was first broached in a 2013 Kill Devil Hills Board of Commissioners meeting. At the time, a number of ideas were put forward with the understanding that the commissioners would take a further look when cost estimates for developing the site were available. Lin Logan spoke at that town meeting, suggesting then that the land could be a “memorial for our son.” At that meeting, the Logans pledged $15,000 to the project. It took a few more years, but finally the Board gave the nod to move forward. Creating the course did not cost the residents of Kill Devil Hills anything, a point noted by Daryl Davies, the mayor’s husband. 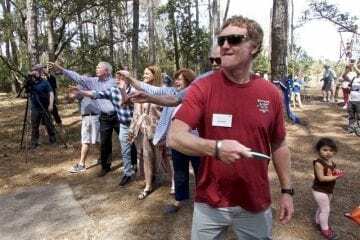 Davies, an avid disc golf player, did much of the design work, and with Bob Sanders of Tortugas Lie Restaurant, was on site almost every day cutting trees and clearing paths for the course. “This wasn’t coming out of taxpayers money,” he said in his remarks. The $15,000 from the Logans helped to start the project, but ultimately it took much more and what Davies described was a community effort to create something special. Davies and Sanders cut almost all of the trees by hand, but a number businesses came to haul the wood away at no charge. Volunteers showed up time and time again. When sponsors were needed for the disc baskets, Outer Banks businesses stepped up. There are sponsors for every basket on the course. Thirty-six baskets — each hole has two possibilities. “I had no idea what a community center this would turn into,” Sanders said. The result is a course already gaining recognition. 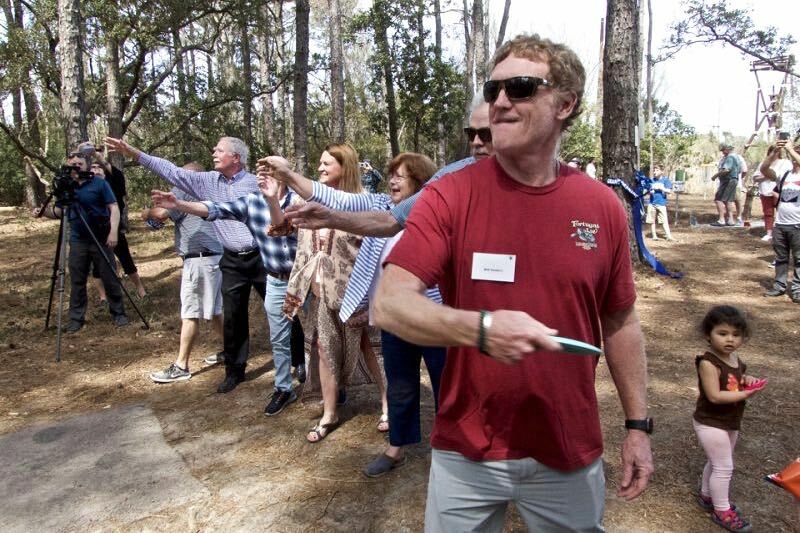 Even before its official opening, disc golfers have been playing the course and liking it. 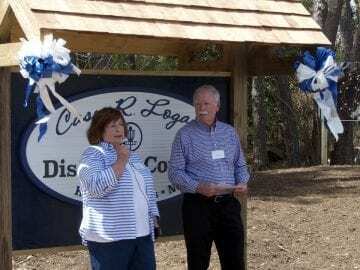 That is what the Logans had hoped the course would be, a place where people could come and enjoy themselves, something Lin Logan talked about in her remarks. “Sometimes I come out here and park by myself,” she said. “I tried to look at this through Casey’s eyes at what was going on. A mother and her adult daughter came off the 18th and they were smiling and happy. A young man … and his dad were having a lesson.